The 4x4 DVI CAT5 Distribution Amplifier is the perfect solution for anyone who needs to send multiple source to multiple displays in remote locations at the same time. 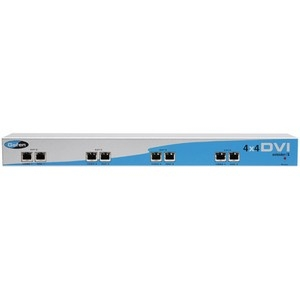 The 4x4 DVI CAT5 Distribution Amplifier has 4 DVI inputs and 8 RJ-45 connectors which are connected to four DVI CAT5MS receivers using industry standard CAT5 cables. The receivers can be placed up to 300 feet away from the transmitter.